Using Peter Schlesinger’s book ‘Checkered Past’ as inspiration, J.Crew’s head of women’s design, Tom Mora sent out an elegant and relaxed collection today at New York Fashion Week, filled with extremely wearable and comfortable clothing pieces and matching accessories perfect for any occasion. 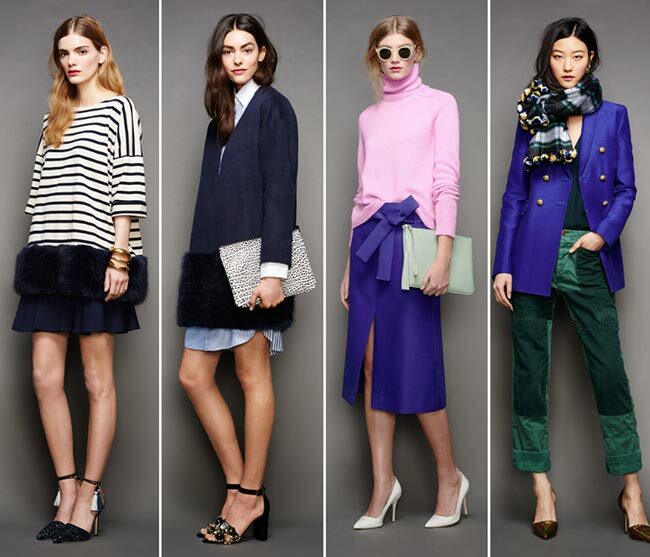 Creativity when it comes to the clothing combinations and timelessness in terms of the designs are the main peculiarities of the J.Crew fall/winter 2015-2016 collection that make one instantly fall in love with these preppy chic outfits. The wonderful mishmash of prints and colors represents the next beautiful aspect of this array of youthful, fresh and trendy clothing pieces. Some of the coolest fall 2015 fashion trends have been captured by Tom Mora in his latest fashion line, most of which center around warmth, comfort and functionality. 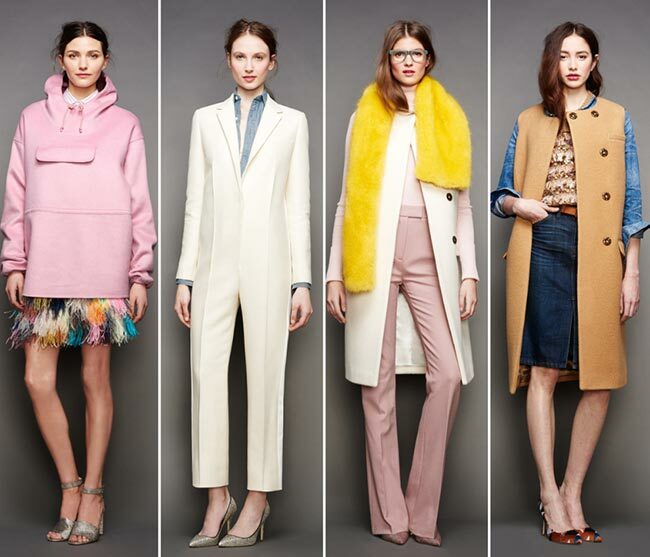 Layering is the first thing we instantly notice in the collection from the very first look unveiled to the last one. Thus the opening look is composed of a blue shirt dress worn under a bejeweled tunic cut at a shorter length, which in its turn is topped with a classic checkered oversized coat draped over the shoulders of the model. A pair of preppy chic sunglasses, classic pumps and a checkered scarf finish this wonderful game of styling and layering. 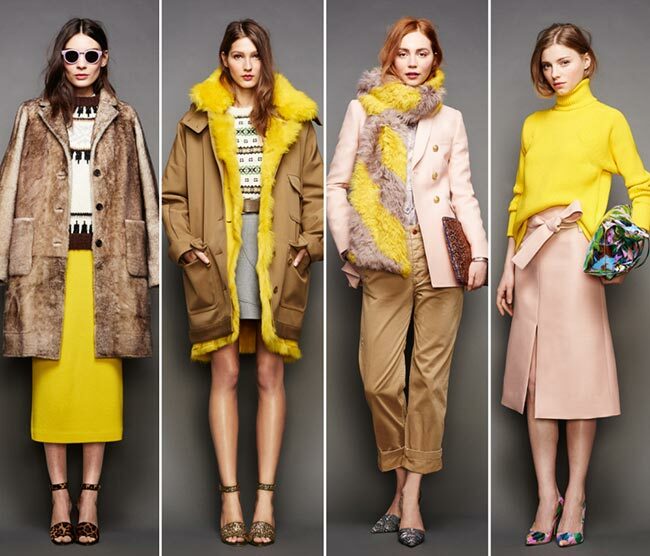 The color palette of the J.Crew fall/winter 2015-2016 collection is as diverse as the styles and shapes available. While the beginning of the show focuses on different shades of blue and gray, we have also pops of lavender, neon yellow and dusty pink, as well as burgundy, white, black and subtle golden motifs. Although the majority of the looks place the accent on the texture and detailing, there are also designs featuring stripes and graphic patterns for added creativity. And when it coms to the former, expect lots of fringing, 3D appliqués, beading and feathers that come to add a touch of extravaganza to the everyday and party looks. 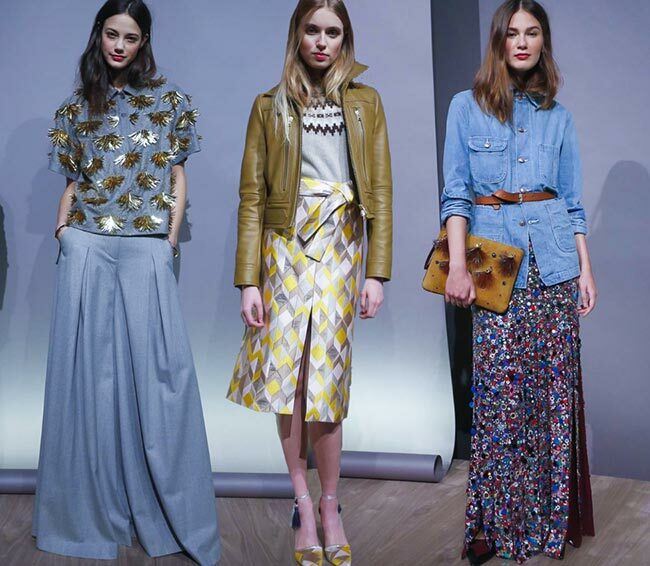 We can see denim is again huge for fall thanks to the various fashion shows unveiled, including this particular J.Crew line, where denim comes in the forms of boyfriend jeans and high-waist retro-style jean looks mainly, as well as a chambray shirt worn under a curious tuxedo-inspired cream jumpsuit that will especially appeal to those trying to combine the modern with the elegant and classic. 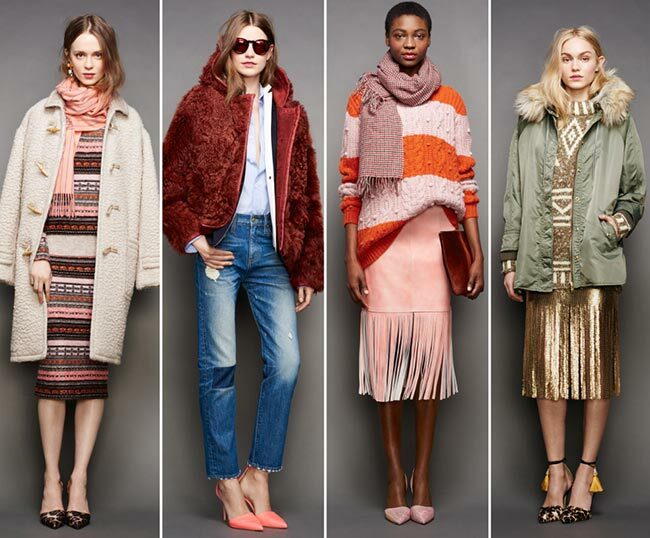 The J.Crew outerwear is also cool bringing the ideal design for every taste and personal preferences. We have cozy faux fur oversized coats, tweed ones, an oversized military coat with bright neon yellow fur trimmings, a khaki leather jacket with zips, a shaggy fur option, as well as structured elongated vests, which seem to be shaping an important trend for the upcoming months. 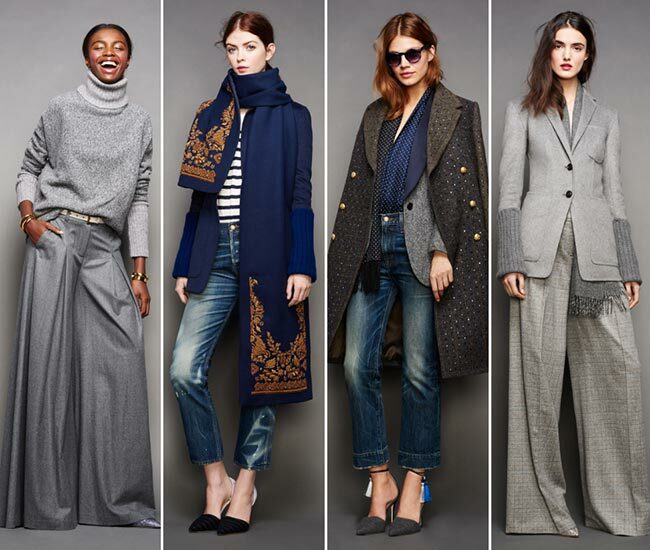 While the knitwear and denim designs are perfect for building up casual looks, the J.Crew fall/winter 2015-2016 collection also has elegant offerings for special occasions. The below-the-knee straight skirts with fringed hemlines are perfect for party wear and can also look toned down when matched with an oversized knitted sweater, while the blue tailored palazzo pants are cool enough to make you land in the spotlight at special events. Troi Ollivierre was the one responsible for the lovely makeup and hairstyles of the models, the former of which was kept minimal with the stress on the flushed cheeks to make one look fresh in winter. The hair was either left loose with a center part or pulled pack into casual ponytails.